An incomplete skeleton is the vessel for the jacket the artist wore while traveling for six months. This jacket has pieces of experiences stitched onto it, and each object possesses a narrative which together form a dialogue. While being 6,181 miles from home and moving through different countries, it acted as the physical covering, a securing shield, and a source of continuity amid the inconstancy. Instead of its usual function as an epidermis, the jacket penetrates the interior of the skeleton's chest cavity which rests horizontally, communicating the notion of sedentary place. 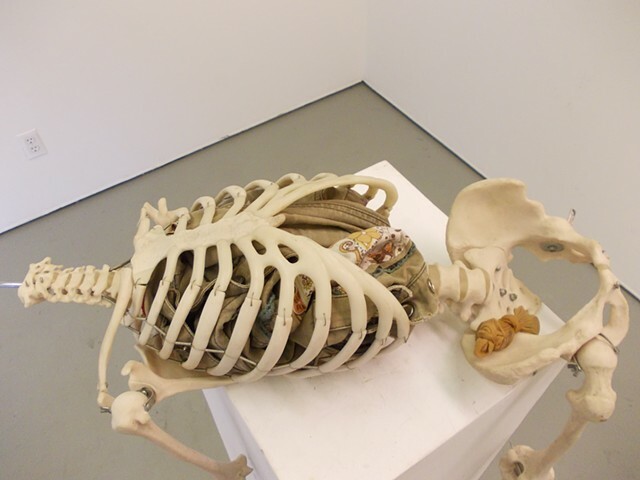 Resting on the pelvis of the skeleton, is a piece of underwear. This small stocking still encloses foreign currency, the remaining coinage left to the artist's name before leaving the final country to return home.